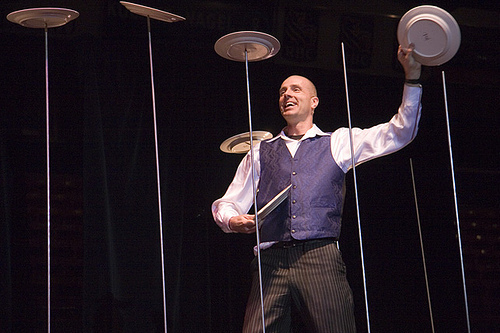 Jerry Shirley, a North Carolina preacher, tells about taking his kids to see a juggler. The performer used poles to balance dishes on. He’d spin a dish on one poll until it was perfectly balanced and twirling. Then another. And another. However, by the time the juggler got down to the ninth pole, the first one was one was slowing down, losing its balance and about to fall. So, he would have to run back real quick and give it another spin to regain the balance. Then run to the next one. And so on. No doubt this made for an amusing and entertaining show. When life gets out of balance we find ourselves harried and hurried. We experience frustration and fatigue. And life seems like it is spinning out of control. This verse casually mentioned these four important aspects of a balanced life: Mental. Physical. Social. And Spiritual. Growth and development in these four areas is essential for a well-rounded life. The Bible challenges us to noble thinking, controlling our minds, and mental awareness (Phil 4:8, Prov. 23:7, 2 Pet 3:1). Relationships with others is a frequent theme in Scripture. Beginning with the golden rule (Matt 7:12) and ending with the second great commandment (Matt 22:39). The “one another” commandments speak to treating others like we want to be treated and loving our fellow-man. Physically, we’re reminded that our bodies are “the temple of the Holy Spirit.” Paul admits that there is some profit in physical exercise (1 Cor 6:19; 1 Tim. 4:8). A properly balanced life does not neglect the spiritual aspect. God made mankind after his image and likeness (Gen 1:26-27). The soul separates us from the animal kingdom. As a result we have the potential to be “partakers of the divine nature” through a knowledge of Jesus Christ (2 Pet 1:4). To neglect the spiritual, is to do so at our own peril. Bible study, worship, and ministry are all needed. Too often, however, we get out of balance and find ourselves with an over emphasis on one area over another. It is easy to become imbalanced. Some people enjoy intellectual pursuits but forget the people. Others enjoy ministry, yet neglect their own spiritual growth. And still others develop great devotion and spiritual piety, but never translate it into practical ways to serve. Study without service may lead to arrogance. An inner life of devotion apart from service may lead to selfishness. Service separated from inner devotion may result in self-righteousness. Furthermore, the a balanced Christian life sees the connection spiritually in all areas of life. Every relationship should be guided by godly values. In our homes and family life. In our jobs, professions and occupations. In civil duties. And in our social interactions with others. Balance is needed in all of these relationships and responsibilities. We must work to provide for our families, but we cannot neglect our family while earning a living. While family time is really important, it should not be emphasized to the point of ignoring our church family and the spiritual obligations enjoined upon us. However, even involvement in too many church activities could lead to an imbalance and a neglect of a vital relationship and important responsibility. A balanced life begins with a relationship with Jesus. And produces peace, purpose, and joy. That’s me in the picture. Thanks for the reference. God Bless!